Lovevery - For Montessori Babies! Birth to 12 Months+. Today I want to share with you a subscription service that is a game changer! There are a lot of Montessori subscription services available. Until now there hasn't been one I would recommend. I am actually really disappointed that I've only now found Lovevery as they are for children from birth to 12 months. But if you are a new parent or are expecting, I'm excited that you may like and use this. I get a lot of emails from parents who don't know what to do with their new babies - this is for you! In the months after Otto was born I was so tired, so much more than I had expected to be. I started googling activities to do with him because I just couldn't remember what was age appropriate, I couldn't even remember what I had done with my previous children at the same age. Not only does Lovevery provide lots of toys and materials for each month, they also provide a guide on what to use and when, a little about what your baby may be doing or interested in and lots of other activity ideas for you to try. It's not pushy or preachy just gentle ideas that are helpful! Lovevery doesn't even advertise as a Montessori service. They have a Montessori expert on their development team but they also have a psychologist, occupational therapist, professors, doctors and, child development researchers. Having looked over their entire package I know that Lovevery suits Montessori families. Some of their materials include black and white cards, mirror, puzzle balls, bell cylinder, interlocking discs, weaning cup and spoon, egg and cup, object permanence box, circle puzzle, open and close containers, pincer grasp block! They also have lots of other fun materials that we would like too such as shape bean bags, play socks and the magic tissue box! They use organic cotton, sustainably sourced wood and they have toys with texture like felt balls and a woven treasure basket. Their designs are also very clean and modern. Let's take a look! All of our Lovevery products are c/o Lovevery. Lovevery has two product categories. The first is the Play Gym. It's large and colourful without being overwhelming. The arch is natural timber and the main base is white with colours on the edging. Does this suit a Montessori home? I think so! It is large enough that it can accommodate a rolling baby and it's also well suited to tummy time. All of the toys are detachable. It comes with the organic cotton high contrast ball (puzzle ball), batting ring (which also has a bell), organic cotton teether, BPA free teething rings, black and white card set, mirror card set, common objects card set, body parts card set and a play guide. It's actually really beautiful. The bottom is padded and the play gym also comes with a cover (see below) so the older child can use it as a cubby, reading nook or covered playspace, it's nice and cozy, Otto also likes to use it to play peek-a-boo. The play gym is perfect for tummy time, the card holder is removable, it stays on with velcro. There are four slots for cards which are interchangeable, we currently have two mirrors on the bottom and two familiar/object pictures on the top. Even now (at 12 months) Otto loves to use the mirrors and all of the cards are fantastic for building vocabulary - so the child will definitely still use them once they are older. I would have LOVED to use this with Otto earlier. The Lovevery site lists all of the materials in the kits. Here I've only shown a sample of what we have received. These aren't the sort of toys that children will use once and then move on. These are the sort of toys that children will keep on going back to over and over again - it's so well thought out. The 'First Wallet' and 'Big Spender Cards' have been Otto's favourite for almost a month now. Cards go in, card come out, wallet gets carried all around the house. The colours of all the products are so lovely, colourful yet soothing! Using this little zipper is great for his fine motor skills. Pincer grasp block. Yes to Montessori materials! This little book is adorable and again Otto takes it everywhere, in his walker wagon or in his bag. The doll is Waldorf style and can be dressed and undressed once the child is older. The quality of the materials is important to note, everything is fantastic quality, everything is holding up after a lot of use. I love these balls. They are called 'Opposite Balls'. One is light and one is heavy. A wonderful sensorial material. Above is a ball push 'Sliding Top Box'. The felt ball needs to be pushed into the hole then the child needs to move the sliding lid to remove the ball. It's a hit here and is used over and over. It's good for coordination, hand and arm strength and developing concentration. The activity kits are full, ours also included stickers that the child can wear for photos but could also be used on photobooks or memory boxes (I'm respecting that Otto doesn't want to wear his). Our play kit also included wooden coins/tokens, the little Animal Book and larger Opposites board book, Scribble cards with envelopes and a beautiful little vase. Above are some of the items that come with the Lovevery Play Gym. All of these could be used by older children and can be used as part of the play gym or separate. The cards are perfect for language development. The black and white cards could also be used on the wall near a baby change area. The Lovevery Play Gym is also available in the US on Amazon (read the reviews!). If you are expecting or have a child under 12 months I recommend having a look at Lovevery, it doesn't matter if you are new to Montessori, Montessori trained or an experienced Montessori parent, you will find it useful. The activity kits could be used alone, you wouldn't even need additional toys, or you could use them alongside other Montessori materials if you wanted to. Lovevery has free standard shipping in the continental US and they also have gifting and baby registry options. Now is a great time for giving family especially Grandparents gift ideas for Christmas! You can also follow on Instagram for lots more product photographs and activity ideas. You might also like the Lovevery blog including the article 11 best Montessori toys for baby's first year. Thank you so much to Lovevery for our Play Gym and Activity Set. Thank you also for developing such a developmentally appropriate and beautiful toy range and guides that will help many families. These large bells are hard to find in Australia... except at Christmas time. I hope you had a lovely day! Earlier in the year I almost ordered the bell from overseas, I just couldn't find one locally. I removed this bell from one of our old Christmas decorations, put some (Christmas) ribbon through the loop and here it is, a Montessori bell on a ribbon! Otto approaches his bell gently and slowly with an open hand. Otis used to really hit his with a closed fist. So different! So what is the Montessori bell on a ribbon? It's simply a large bell hanging by a ribbon, it's really a tactile mobile and can be hung anywhere you would put your infant's mobiles, over a movement mat, or playmat, in their room or in a living area. It's also easy to hang on the infant's playgym. Typically offered around three to four months. The child is learning cause and effect and is developing the core strength and coordination needed to raise their little arms and stretch out their fingers to tap or bat at the bell. The child is having an impact on his environment which is significant for infants who are not yet purposefully grasping or crawling. The child is getting feedback and is learning about himself and his environment. 'I can tap the bell and I can cause it to ring', it's great for their ego! A child’s body is continuously growing and changing, and his environment needs to offer different opportunities for movement. We need to provide an environment that promotes movement at every stage in development. The bell acts as an auditory stimulus for movement and provides glorious feedback (the lovely ring of the bell). "Very often parents and adults understand that children need to have space to move around in. This knowledge is not enough. There must be concrete activities to perform, because if we wish to promote the integration of the human being, the motor skills should always be used in the service of the mind. When this happens, the activity becomes self-satisfying. The pleasure resides in the activity itself and in the result that can be obtained from it, in the joy of moving the body in space in response to interior desires and in having success in what you do. There is no need for prizes or approval to keep the child working at his activity." Understanding the Human Being. Bell and Ring on a Ribbon at Bunny + Bella (UK). Bell and Ring Montessori Mobile Gift Set at Essential Montessori (US). Montessori Hanging Toys for Babies - Hanging Bell and Hanging Ring at Pink House (US). Otto's Christmas bell (as pictured above) is around 2.5 inches across (similar here), if you are going to DIY you could use a bell as small as this at 1.5 inches (which is the same size as Otis' bell here). When Otis found some holographic cardstock in his paper stash, he wanted to make a mobile for Otto. The Octahedron and Dancers Mobiles have been Otto's favourites so far and it is in part due to the nice shiny, metallic paper. While ours is not as elegant as the Dancers, nor as complicated to balance, Otis loved making it, Otto loves using it and I have to believe that it's somewhat age and developmentally appropriate for Otto. We used this holographic card (Australia) but similar can be found here. Otis used holographic card, stencils, pencil, scissors, glue, tape, fishing line (transparent nylon thread) and a piece of thin wire. Otis used his stencils to trace shapes on the holographic card and then cut out the shapes. He made two of each shape and six shapes in total. He lined up the shapes in two columns. He taped the fishing line to the back of the shapes and then he glued the corresponding shape on the back (so the shapes were back to back with the fishing line taped in between). Then he tied the fishing line to a thin wire. We used more fishing line to hang the wire to a hook in the ceiling about Otto's movement area. Otis really wanted to add more shapes but I've had him pare it back for simplicity and not to overwhelm Otto, noting that most Montessori mobiles have around five to six elements. We kept it to three colours for the same reason. The holographic paper catches the light and the shapes look lovely when they move in the breeze. This mobile was super easy and fast for Otis (six years) to make. To be honest, Otto loves just about any mobile, but it's extra nice that this one is made by his brother. Around here this week. Montessori Materials at Three Months. Around here this week, this is just a snapshot of some of the materials Otto is currently using at three months! He constantly has his fingers in his mouth and is chewing on his hands. After finding Otto gnawing on the Skwish, I ordered what is known as a Montessori Teething Ball or the Perfect Pacifier. I ordered ours from here (Australia). I need to pass it to Otto but he can independently hold it, bring it to his mouth or throw it away. Montessorians prefer it as it is easily manipulated by the child, it provides relief (from the pain of teething) and does not sit in the child's mouth. The Skwish is fabulous because it's so easy for the young infant to grasp and pick up. The rods are really thin for the small hands and they sit up off the floor, at three months the child can easily pick it up. It's colourful and it makes a nice sound with the wooden parts sliding when moved or shaken. It's his number one favourite toy at the moment, I was so surprised around two weeks ago I walked in to find him holding his Skwish to his mouth and gnawing on the end of it. It can roll but not too far unless thrown hard by an overly exuberant child! The Dancers Mobile. This is as much loved as the Octahedron. He will often spend 30-40 minutes here in the morning. Great for building concentration, visual tracking, you know the rest! Our Dancers Mobile is from here, they have international shipping, I love their transparent rods which means there is no distraction for the child. The Bell Rattle is perfect for Otto at this stage in development. I gave it to him after observing the first signs of intentional grasping. I observed him playing with the long tag on his favourite blanket (which he would often do) but now he was grasping it and pulling on it. I found him grasping his Skwish and he intentionally pulled one of my shirts off a coffee table. The Bell Rattle is a good size and weight for his small hands and he can see the bell so he is learning cause and effect. He also loves this Willow Rattle which he can pick up independently as it sits a little off the floor, he can get his little fingers underneath it. Our Bell Rattle is c/o Montessori Shop. You can see Otis' bell rattle here. If you are in the US or Canada, I recommend this one. With Otto being my third child, I can really appreciate how different each child is. I don't always agree with the recommendations on other Montessori sites and that's ok, our children and experiences can be vastly different. I hope however, you find this post helpful! I want to share with you this cute mobile that Otto has been using and absolutely loving. We've used it hanging on the play gym and now over the movement area. The child can bat at or pull on the ring to make the wooden bells (or chimes) ring. The sound is lovely although Otto, like most children I'm sure, gets a little vigorous and swishes them around. He also tries really hard to put the ring in his mouth, he's definitely teething. Like most tactile mobiles this is good for developing concentration, coordination, arm and core strength, visual tracking and learning cause and effect. It also allows the infant to have control over their environment, they can just lie there and watch it, they can bat at it or pull on it to make the sound. The ring and bells (or chimes) are all wooden and the sound is a lovely organic (wood clanking) sound. If you are looking for a tactile mobile other than the bell or ring on a ribbon, this might be one to try. The sound is different to the bell, the child has more influence over this mobile in that there is more of it to move and the sound is louder, and there is still the ring to grasp. I'm forever influenced by this room at Three Oaks. Before Otto was born I went into one of our local baby/toy stores. I wanted to see in person the baby car seat we had chosen, normally I'm happy ordering online avoiding such places. I was totally overwhelmed. The store was so bright and overstimulating, I wanted to leave immediately. It made me appreciate the Montessori knowledge and materials that we have accumulated over the years. It also made me understand how confused and overwhelmed many new parents must be, thinking they need all of these things, possibly not knowing there is another way. 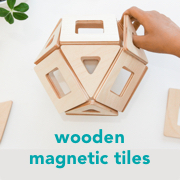 Most of the Montessori materials are not more expensive than the toy store materials but in many cases they are harder to find, especially if you are outside of Europe or the US. I'm showing the above graphic not to depict the specific toys, but the aesthetic, the look of the Montessori materials. Imagine these in your home, how would they make you feel? Montessori infant home environments are not devoid of colour, the colour just comes from fabrics, plants and artwork on the walls, not from overstimulating, bright toys. If you are interested I've listed the sources for the Montessori materials: Playgym*, Walker, Gobbi Mobile, Bell Rattle, Ball Cylinder, First Stacker (similar here). Please also note that we are not perfectionists, there are items that don't meet this criteria that make their way into our and many other Montessori homes and play areas. Disclaimer: I have used the terms toys and materials interchangeably, these are not materials designed by Maria Montessori but rather toys that are more in line with the Montessori philosophy in the home environment. *The Playgym pictured above doesn't have any toys on it, initially we would put one toy or material on it for the child to focus on visually or for a slightly older child to bat at or grasp (such as a bell or simple wooden ring). If you are looking for toys or materials for older children this is an excellent resource - A Montessori-Inspired Checklist for Choosing Toys at Vibrant Wanderings. Montessori Baby - No Mobiles, No Problem. Inexpensive Montessori Mobile Alternatives. I've written extensively about the Montessori mobiles, but what if they just aren't for you, what if you are looking for inexpensive alternatives using materials from around the home? Here are a few ideas. Plants! Otto has a smaller plant in his room that he will often focus on, it's well positioned next to his movement mat. The area pictured above is under a window so this monstera plant's large leaves will move gently in the breeze, providing just enough movement to engage Otto. This plant also provides interesting shadows which I can see him observing later in the day. The fringe on a blanket, scarf or shawl. I remember seeing a similar set up at Michael Olaf, where the baby was visiting a home with no mobiles and the family put a scarf on a lamp shade - perfect! Otto is only a week or so younger than the child in the video, so it was worth a try. Toys! Toys hanging from a hook in the ceiling or from a baby playgym provide similar opportunities as the tactile mobiles like the bell or ring on a ribbon. Above he is using the Skwish which is nice and large (easier to connect with) and makes a soft rattling noise when he bats at it. Round rattles or teethers provide a nice grasping opportunity but many like this also make a nice sound. Almost any rattle will do - use what you already have at home. Above is his favourite rattle, it has a bell inside that makes a sweet sound. This provides a similar opportunity to the bell on a ribbon. He loves to bat at his woven ball when it is presented like this. It has a bell inside which is nice and clear. The size of the ball also makes it easier to hit. I know I don't need to cover the benefits of using such mobiles (visual tracking, coordination, concentration, learning cause and effect) but it's just wonderful to watch the joy and excitement the child gets from using them. Concentration in the very young child. Is the young child capable of concentration? How about a child of one month? How long can they concentrate for? I know that a young child, from birth, is capable of concentration. Sometimes we need to see it ourselves before we can believe it. A young child needs to be given the opportunity to concentrate. They need time and space. They need for us, the adult, to be patient, not to interrupt. We need to provide a home environment that is just right, not too much (stimulus) and not too little. It's what I love about the Montessori approach, it has taught me how to prepare our home environment, specifically for our child. I didn't have a post written for you tonight but I wanted to share these pictures I took of Otto at seven weeks, concentrating and getting so much joy from his Octahedron mobile. The concentration, the visual tracking is real. Otto is at first very still, then he gets a little excited and starts kicking his legs and waving his arms, he starts babbling (talking) but never takes his eyes off his mobile! This response is different from when he used his black and white mobiles, the engagement is so much more obvious. Have you or did you use the Montessori mobiles, did you find it helped the child develop concentration or even independent play? I'm starting to look around for ideas for Otto's playgym. You know I'm hanging his ball and perhaps a bell on a ribbon, ring on a ribbon and a few other interesting toys. I've been looking around for some inspiration! "When the infant, who has been looking at a toy hanging above him and intuitively reaching for it, finally reaches it and makes it move, this is an exhilirating moment. Instead of just being cared for and acted upon by others, the infant has reached out and intentionally acted upon his environment. He has literally "changed the world." Carefully selecting toys at this stage includes looking for those that support a wide variety of movement possibilities for the child. Each rattle, toy, puzzle and other piece of material has been chosen for a specific purpose. Best is when the toys, such as a wooden ring or a large bell, can be hung from the ceiling, or from a natural wood toy hanger. Hanging toys will need to be rotated to keep the child interested and happy, or you may want to arrange to have hanging toys in more than one place in the house." The Joyful Child: Montessori, Global Wisdom for Birth to Three. Ring on a ribbon. Note the elastic so the child can pull on the ring and it has a little give. This shows nicely how this family has incorporated the infant into the home living areas! Gorgeous ribbons and a bell for auditory stimulus! Nice to see how this playgym fits into this parent-infant class. This one isn't strictly Montessori. Montessori would encourage us to have one material/item for the child to focus on, but this is really beautiful and is simply another way of displaying some natural materials for visual tracking. This is also a reminder that tactile mobiles and the playgym can be used for tummy time too. Love this little tripod playgym with the bells! This space is a little cluttered and I'm sure would be simplified before introducing a baby, however you can see some interesting items on the playgym, some textured ribbon, some wooden rings and a bell. So many ideas here. I hope you've enjoyed these as much as I have! If you are reading this in an RSS feed (email) or cannot see the images, please click through here to read the full post. Mobiles are considered to be the child's first work but have you ever wondered what are the benefits of the mobiles, why go to all the effort, what's the big deal? There are physiological and psychological benefits to using the Montessori mobiles with your infant. "The process of myelinization of the nerve fibres is very quick and begins with the eye muscles. The child learns to control them in one month allowing him to follow what is happening in the environment much better. This is already an important step, since it implies a freedom to observe. Adults should recognize this progress and give the child the opportunity to make use of his new ability." - Understanding the Human Being (Australia here). 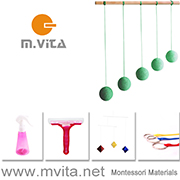 We know that the Montessori series of mobiles promotes visual tracking and visual discrimination, develops concentration and strengthens muscles in the eyes, neck, arms and even core muscles. Some mobiles are suitable to use during tummy time which can also promote the child slithering or creeping towards the mobile. "The first essential for the child's development is concentration. It lays the whole foundation for his character and social behavior. He must find out how to concentrate, and for this he needs things to concentrate upon." - The Absorbent Mind. For the young infant, the mobile provides the perfect opportunity for concentration. The child is also learning about independence, the young infant is working on their own for extended periods of time. The child will increase their concentration while tracking the mobile. I've observed my children kicking and waving their arms in excitement at the mobile and I've also observed them completely still in deep concentration. There is also a psychological purpose to the mobiles. When the young infant is visually tracking and then physically moving toward the mobile they are developing coordinated movement in order to reach, touch or bat at their (tactile) mobiles like the ring or bell, the child achieves a sense of accomplishment, fulfilment, they develop a sense of trust within their environment and themselves. The child begins to learn they have freedom of movement, they can see an object, reach for it, bat it or grasp it and explore it, knowing that if they want something they can go and get it. There is a developing relationship between movement and knowledge, the child begins to understand they can work towards a goal or object and develop their movement towards that goal or object. For the infant the mobiles are often the first stimulus, the first opportunity for this development. The mobiles can be placed in an area where the child can be present with the rest of the family. Perhaps above a mat in the living room or playroom. While we have put most of our mobiles in the children's bedrooms, we've also (at the same time) had tactile mobiles (mainly the bell on a ribbon) in our lounge room over a soft lambswool rug. The Joyful Child recommends not putting the mobile above the change area where the conversation with the parent or caregiver is more important than the visual distraction. It's also not recommended to hang the mobile about the child's bed, as the bed is for sleeping (and rest) and the mobile is for work. You'll often see mobiles above a movement area, a soft mat or blanket next to a wall mirror, however, the mobiles do not need to be near or against a mirror to fulfill their purpose. I would place the mobiles above the infant, initially around 30cm above which is approximately the distance a newborn can see. The mobiles should be in front of the child, above their chest so they can look forward at the mobile, not directly above their face, this is so the child can choose to look at or use the mobile or not, it is easy for the child to look away and focus on something else if they are not interested. We've used hooks on the side wall (I've also used a piece of washi tape) to be able to hook the mobile to the side, out of the infant's line of sight, so they can also use the space without using the mobile. By observing the child you can determine when the child has finished with the mobile and you can then play or move onto something else. As with any of the children's work, try not to break the child's concentration or interrupt. We want the child to feel fulfilled, to finish their work independently. You will need to rotate mobiles to keep the child's interest. If the child is bored with the mobile or doesn't engage with it at all, it's possibly time to put it away and try another mobile. We try to keep the mobiles developmentally appropriate which is why we start with the Munari or other black and while mobile and then move to other colours and shapes and then onto tactile mobiles. I try to only put my children under a mobile when they are well rested, fed and able to concentrate. I don't have any expectations, sometimes my newborn will spend five minutes under the mobile and other times he has stayed there happy for up to forty minutes. It's also nice to have the mobile moving so I usually open a window so the mobiles can move gently in the breeze. You can read all of my previous posts about Montessori infant mobiles here including all or our mobiles and lots of mobiles by other families. For more ideas and inspiration have a look at some Montessori Mobiles on Instagram! Above Otto is gleefully using and already batting at the Octahedron mobile. Montessori Newborn and Infant finds on Etsy! Do I have an unhealthy obsession with Etsy? Perhaps so. Here is what I am loving (and possibly buying) on Etsy this week! Butterfly Mobile - Etsy is the best place to find Montessori mobiles and I am always drawn to the butterfly mobile. Montessori Grasping Beads - includes wooden and coloured rubber beads. Organic Plush Topponcino and Hyde Park Organic Cover - I have ordered this cover, I love neutrals but I love this design too. Wool Puddle Pad/Change Mat - a reminder that you don't need a plastic, non-compostable/recyclable baby change mat, there are better options! Butterfly and Moth Poster - for anywhere in the home but I love this for an infant space (there is a smaller printable version here). Wooden Tactile Set - these would be lovely in a treasure/discovery basket. Calm + Content Baby Massage - I've never met a baby that doesn't love a calming massage. If you love handmade and Etsy as much as I do you might also like my recent post on Montessori Rattles. Image: The Montessori Company, Home Environment 5-12 Months. We are in the process of planning a Montessori nursery and it can sometimes feel overwhelming. Today I wanted to share with you a new feature at The Montessori Company that can guide you through the process. The Montessori Company is dedicated to ensuring the beauty and philosophical consistency of Montessori environments everywhere, making it easy for parents and guides to buy hand-crafted products designed to follow Maria Montessori's philosophy. On The Montessori Company website, you can view three Montessori nurseries or rooms (one pictured above) and you can click on each area and see the specific product recommendations for that area. For example in the areas for sleeping, physical care, movement, and for feeding/eating. All products are listed in The Marketplace. Some of the products are stocked by The Montessori Company and others are through alternative vendors. This feature takes a comprehensive look at the child's prepared home environment like I haven't seen before! The products in The Marketplace have been curated by an AMI Montessori Guide. Michelle is an AMI trained primary and elementary guide and has almost finished the Assistants to Infancy (0-3). Michelle and her husband Paul are expecting their first child in August and so naturally there is a focus on 0-3 materials! The Montessori Company also stocks a wide range of downloadable card products including vocabulary, three-part, culture and maths cards. I love finding new and different downloadable cards as they are affordable and accessible no matter where you live. The Montessori Company card products are unique as they are all painted by an in-house artist and are therefore all very beautiful! The downable products are all suitable for the home and school environment. I also love to find some Free Printable Materials. The Montessori Company currently has Part of an Airplane, Bird Vocabulary Cards and Riddles cards as part of their free printables. Michelle is passionate about helping parents and educators and this comes through in the care and consideration in developing The Montessori Company and The Marketplace. Congratulations to Michelle and Paul on this venture and best wishes for August! This post is sponsored by The Montessori Company. You can also find The Montessori Company on Facebook and Instagram! Montessori Infant Room 3-6 months - an overview. Ball Cylinder, Bell Rattle, Bell on a Ribbon, Ring on a Ribbon, Bell Rattle, Various Rattles, Triangles, Rattle Ring, Skwish, Teether Toy, Wooden Bead Rattle, Interlocking Discs, Wooden Teething Toys, Teething Rings, Teething Balls, Soft Balls, Textured Balls, Puzzle Ball, Mini Playsilk.